The Therapeutic Massage Clinic is celebrating 10 years of offering complementary therapies in the north east of England. The clinic was set up in June 2000 by Helen Richardson after a career that included a stint at Ragdale Hall, as Spa Manager at Slaley Hall and Perfumery Manager in Surrey. Helen has been a trainer in industry since 1997 and now also runs the Therapeutic Massage School offering training to therapists. The clinic is now located in the prestigious Darras Hall Surgery in Ponteland. Here Helen offers massage therapies for pain relief, injury and stress related conditions. She has over 17 years experience and has worked in cancer care, with sufferers of arthritis, Parkinson's disease, depression, muscular pain and so much more. Her clients have included St Oswald's Hospice, Sunderland College, The Sleep Inn and Gateshead Childminding Network. The clinic began offering massage, aromatherapy and Indian Head Massage but constant training and study under the guidance of clients has led to the introduction of more therapies. This includes Reflexology which Helen was initially very sceptical about, "I couldn't understand how Reflexology worked and although we still do not fully understand I see the benefits continually. I am amazed at what I can pick up and the feedback I receive from clients to point them towards a healthier more balanced lifestyle". Deep tissue massage is a very popular treatment and Helen feels "great results" can be achieved yet few therapists offer this. 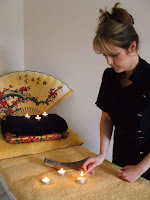 However, Helen also comments that aromatherapy is ever popular as is the deeply relaxing Thermal Stone Massage. The clinic also offers acupressure massage, Daoyin Tao and Hopi ear candling. In the tradition of the therapeutic approach to celebrate the 10th anniversary of the clinic Helen is arranging to give back with a charity event for Macmillan Cancer Care. On Tuesday 8th June from 8am - 11.30am there will be a coffee morning at the surgery to raise funds for the charity that does so much for those suffering from cancer and their families. "Cancer is a major killer and at some point most of us are affected by it in one way or another and we need to help those who are affected until a cure can be found. My own family and friends have relied on support from Macmillan at the worst time in their lives and I believe the help and advice they provide is essential. This is why I have decided to support Macmillan on this occasion". Please support the event when not only will refreshments be available for a donation but also taster treatments and advice on massage, nutrition, homeopathy and more. There will also be a prize draw with prizes from many generous local businesses such as the Deli at Darras, HB Opticians and Behind the Scenes, plus of course the satisfaction of supporting a really worthwhile cause. For more information please contact the Therapeutic Massage Clinic on 01661 871748 or go to www.therapeuticmassageclinic.co.uk. Please try to support the event at Darras Hall Surgery, Broadway, Ponteland on Tuesday 8th June from 8am.